What? Rubberized asphalt is a hot-mixed asphalt pavement containing crumb rubber. The crumb rubber serves as a “modifier” of the liquid asphalt. It’s addition gives the liquid asphalt greater viscosity (resistance to flow) and improves other properties which resist reflective cracking and rutting, and prolong pavement life. The crumb rubber utilized is generated from processing scrap tires. The tires are shredded and the steel reinforcement and fibers separated from the rubber. The steel reinforcement is commonly recycled into new reinforcing steel used in structure construction and the fibers commonly recycled into pads used underneath carpeting. Why? Rubberized asphalt concrete provides a longer lasting, more durable surface course than asphalt paving which doesn’t contain crumb rubber. Thus, the frequency of maintenance is greatly reduced due to the longer life cycle. When? Rubberized asphalt is frequently used as the surface course material when roads are resurfaced or reconstructed. While it is impossible to predict actual pavement performance, there are roads surfaced with rubberized asphalt which have not been resurfaced in over 15 years. Typical performance should be in the range of 14 to 18 years. How? There are two common processes for adding crumb rubber to liquid asphalt. The first is referred to as the “field blend” or “wet process.” Under this scenario, the crumb rubber is added to the liquid asphalt at the asphalt plant before being mixed with the aggregate (crushed rock and sand). 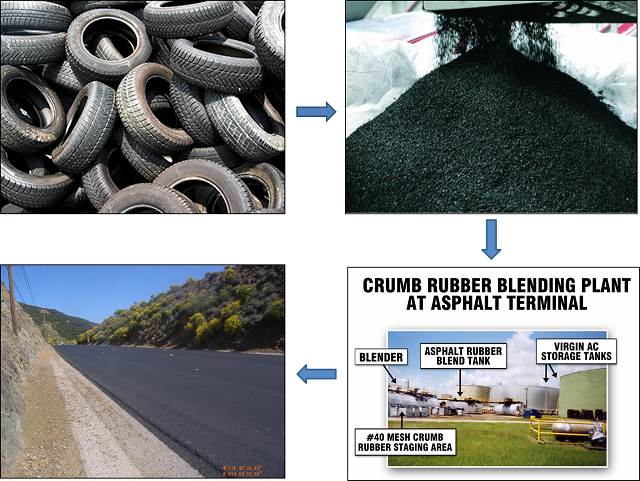 The other process is referred to as the “terminal blend” method since the crumb rubber is blended with the paving asphalt at a refinery. Under this scenario, the crumb rubber is dissolved into the liquid paving asphalt at a refinery before being shipped to the asphalt plant. Rubberized asphalt is placed similar to other hot-mixed asphalt concrete pavements using a paving machine and rollers. After the rubberized asphalt is placed and before it is opened to traffic, a rock dust blotter is sometimes placed on the surface. The purpose of the rock dust blotter, which is gray in appearance, is to prevent vehicle tires from sticking to the pavement surface.